I'm taking a cut at a new solar water heating system that is an easier and quicker DIY project than our current $1K system. 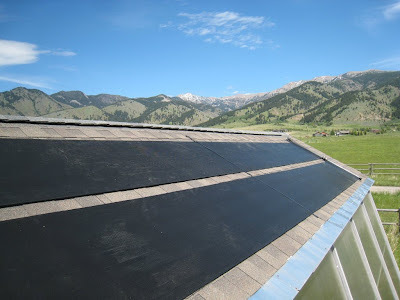 While our current $1K solar water heating system has been popular and lots of people have built it with good success, it does require the building both the collectors and the solar storage tank yourself, and that takes a bit of time. The aim of the new system is to make the job of doing your own solar water heating system quicker and easier by using all off the shelf components that just need to be mounted and hooked up together. The prototype is very much a work in progress, and I'm looking for ideas and comments. Please look over the design and build, and if you have any thoughts on the system please leave comments on that page. 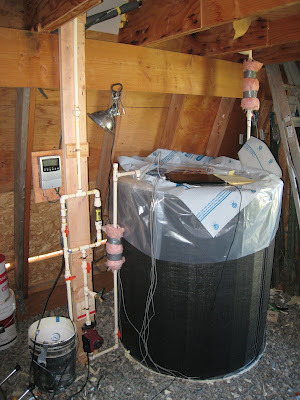 The system design is very much like the existing $1K system in that it is a drain back system that uses a large, non-pressurized tank for both the drain back tank and for heat storage. It also uses the one pass large coil of pipe heat exchanger to preheat cold water before it gets to your hot water heater. The 80 sf of pool heating collector in place. The collectors are lightweight and easy to handle and install. You can put 40 sf of collector under one arm and easily climb a ladder. The three season performance of these collectors is good in a solar water heating application, and there are some ideas on how to improve the not so good winter performance -- maybe you have more ideas? A nice side benefit of using these collectors is that they are SRCC OG100 certified, and therefore the whole system qualifies for the federal tax credit, and maybe state rebates depending on where you live. The prototype collectors are Fafco SunGrabbers bought on ebay. The tank is the Softank kit offered by American Solartechnics. The kit goes together easily and the tank holds about 180 gallons of solar heated water. The Softank with 175 gallons of water. and not trimmed things back and tucked things in. The controller and pump are visible at the left. The insulation bulges on the pipes are covering temperature logging sensors. The controller is an off the shelf differential controller from sun-pump that has all the advanced features at a not so advanced price. most of the wiring for the whole system. The pump is a Grundfos 15-58 three speed HVAC circulation pump. These pumps are relatively efficient and very rugged with a reasonable price. 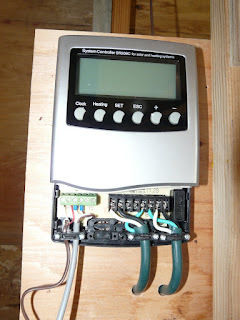 The Grundfos pump -- this is the rest of the wiring. The heat exchanger is a large coil of PEX pipe that is immersed in the tank. Cold water from the street takes one pass through this coil to be preheated on its way to your hot water tank. It is the same one that is used in the $1K system and is explained in detail there. The system is plumbed together with easy to use CPVC pipe. 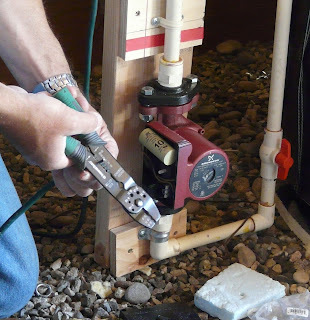 This is the easiest system for people new to plumbing. You cut it with a scissors like device and the joints are just glued together. Goofs are easy to fix. There is a little bit of electrical wiring is that is easy and safe to do. 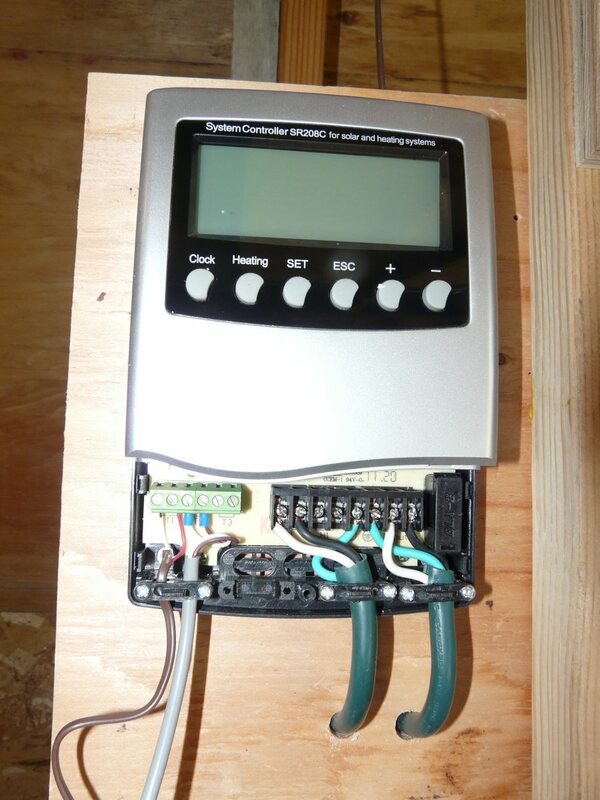 The target cost for the system is around $1300 before rebates. Depending on your rebate situation, payback may inside one year. The "going together like LEGO's" title is no doubt an exaggeration, but the system is designed from the bottom up to be easy to put together. somehow a plastic absorber does not seem very efficient, and what kind of life expectancy does Fafco claim for their collectors? The plastic panels are efficient because the flow channels are very close together. The efficiency curves are shown at the link. From what people report, life expectancy as is in the 15 year area. They are relatively easy to replace. I have done a little more work on this looking at some form of glazing that would leak enough airflow under the glazing to keep stagnation temperatures from damaging the collector. Hope to have some results in a couple weeks. One thing that has surprised me is that even in the depths of our Montana winter the system is still producing some hot water -- on sunny days, the tank will get up to a bit over 100F. Without a tempering valve, reduction of the water heater's setpoint temperature is the most direct way to reduce scalding. However, for sanitation, hot water is needed at a temperature that can cause scalding.